Christmas packages. Each package had a bag of fruit, 5 lb. bag of potatoes, rice, a package of toiletries, and spiral hams were handed out. It was because of generous donations during the holidays we were able to provide these hams and goodies. We thank you for these helpful donations and your time. Giving is always better than receiving. The Fullerton High School Student Council and teachers, under the direction of Dave Wamberg, had made dozens of cookies and candies for the clients of the Fullerton Food Pantry. 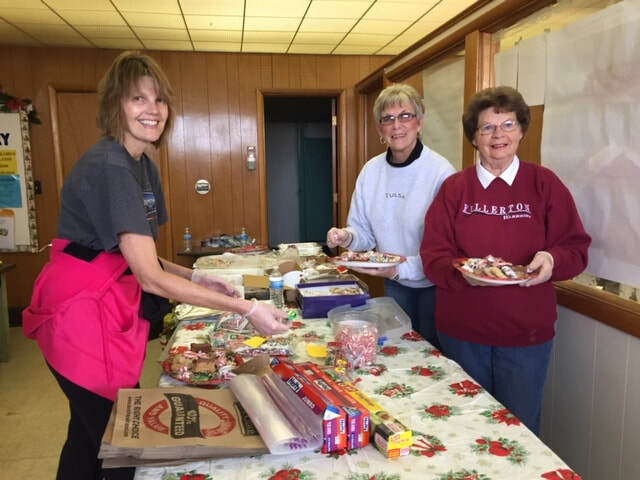 Wylene Novicki, Margie Syslo and Kim Wamberg helped by dividing the cookies onto cookie trays to give to the clients for Christmas. In December the students also went door-to-door collecting all kinds of nonperishable food for the pantry. They were able to collect a pickup box full of food. Amazing!!! A BIG thank you to all these volunteers and community who helped make our Christmas at the pantry a special one and help restock our shelves for the New Year. Happy New Year 2019!!! Family and many volunteers and individuals who donated food and money.